Before we talk about the “evil” nature of sugars and starches (and therefore grains since they usually provide the majority of starches in a horse’s diet), we need to talk about carbohydrates. Sugars and starches are carbohydrates, but fibers are also carbohydrates. 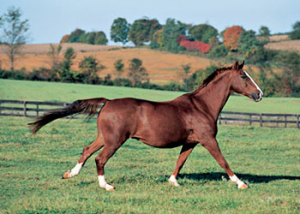 Fiber carbohydrates (structural carbohydrates) are important in a horse diet, and are primarily provided by the forages (grass or hay) that the horse eats. When people talk about feeding a “low carb” or “no carb” diet to horses, that implies that we need to reduce or eliminate the hay or grass in the horse’s diet as well as the concentrate (or grain-based) feeds. That is usually not what we want to do, because fiber is essential to maintain the health of the horse’s digestive tract. The sugars and starches are nonstructural carbohydrates or NSC (sometimes referred to as soluble carbohydrates). In some situations it may be beneficial to reduce the NSC in a horse’s diet.